What's up Hokie Nation! Just want to say I am honored to interact with everyone today. From 11:00 AM - 12:00 PM EST today, feel free to ask me anything. Leave any questions ahead of time. I enjoy a great discussion or sometimes a rational debate, haha. I often remind people I was the first Vick at Virginia Tech but because I didn't score any touchdowns, I don't receive the same attention as my cousins who were quarterbacks. But on a serious note, I am the proud father of 3 children and have been married for 17 years. I grew up in Hampton and Newport News, Virginia. I attended Hampton High School where I played for the legendary Coach Mike Smith. During my senior year at high school, I was selected as a Pre-Season Blue Chip All American, 1st team All District, All Region, and All State as an offensive lineman. I also lettered in track and basketball. I know you saw track but of course I didn't run, I did field events, lol. I often joke that I am glad we didn't have social media when I was younger because things were pretty crazy when I was in high school and even crazier in college. But I am glad social media exists now because I typically have something to say. But keep in mind I only speak on what I know. I learned a long time ago, stay in your lane or you might crash! Since graduating from VT, I moved to Northern VA after getting cut from the Baltimore Ravens. I currently reside in Prince William County where traffic "will get after ya!" HaHa. Since moving to Northern Virginia, I've done a lot. I have done radio shows, broadcasted the Virginia Tech Spring Game, become a columnist for 247Sports-VTScoop and a business owner. But my biggest passion is helping others – the youth and their families. Over the last 22 plus years, I have conducted motivational presentations and workshops focused on empowering youth and their families to become successful in all their endeavors. I remain committed to assisting with the educational, spiritual, mental, and physical development of all young people. 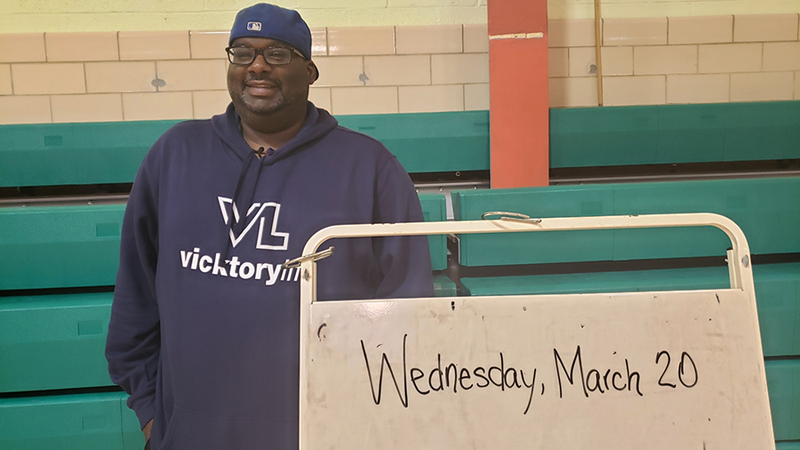 In an effort to help youth achieve their dreams of becoming successful, I created Vicktory Life where I am the Director of Student Development. In this role, I advise, mentor as well assist students with their career development, goal setting, and life skills. Oh yeah you can follow my company on Twitter at @vicktorylife. My question: You get to offer a piece of advice to every current recruit on why they should be a Hokie. What do you tell them? When I see recruits, I tell them to make the best decision for them, I have been around and interacted with some big time recruits. I don't think VT is for everyone but I do believe it is a great school and you can reach all of your individual and team goals at VT. I have interacted and worked guys like Tim Settle, Greg Stroman, Reggie Floyd, Ricky Walker, DeShawn Hand, Jalen Holmes, Ricky Slade and others. With that being said, guys have to be smart about where they go to school. I tell them VT is a special place and really feels like home. Piggy backing off of this comment, I recently read a comment somewhere concerning Virginia Tech's efforts to attract more African-American students and how the relatively low numbers of such students at Tech was a major hindrance to that effort. This is exactly what I heard from some of my friends on the team more than 40 years ago. I can't recall what all those guys said, but do know some of them chose Tech for reasons similar to what you have articulated here. They themselves were a diverse group, from down your way, the swamps of Georgia, the hills of Tennessee and even West Virginia. Do you have any ideas on how Virginia Tech could make the school more attractive as a destination for four years or more where students of color could work on becoming those things they want to be in life? This is not necessarily for student althletes either. "The world ain't all sunshine and rainbows. It's a very mean and nasty place and I don't care how tough you are it will beat you to your knees and keep you there permanently if you let it. " Rocky B.
Brenden Hill mentioned it a couple times in his AMA here. I'm also curious to hear how much this affects a recruit's interest in VT.
UVa/Charlottesville has a much more complicated history with race relations than VT/Blacksburg (culminating in the white supremacist march two years ago)...has that dissuaded interest in young African American students to attend UVa? When I went to college (mid to late 2000s), almost all of my Wahoo ethnic friends had a negative collegiate experience. I'm more concerned about the recruits we're losing to Clemson than the the ones (if any?) that we're losing to UVA. Right, the point that I was trying to make is that UVa has a worse "diversity problem" than VT but I wondered if that meant minority interest has declined at a further rate compared to VT (more of a total student body question than limited to just student-athletes). I don't think we're losing any recruits to Clemson football because of race. We lose them to Clemson because Clemson has a better pipeline to the NFL, better facilities, more coaches to help hone your skills, 2 national titles in the last 3 years, etc. Do your Wahoo friends have specific details of their negative collegiate experience based on ethnicity? I had one who had racial epithets (not comfortable saying which ones) drunkly shouted at him at the corner. I've had a couple who felt like they were "outsiders" during undergrad and felt like they had to "self-segregate"... Unfortunately, those aren't incidents isolated to Charlottesville as I've seen/heard similar at other college campuses...but the Daisy Lundy assault and the "Unite the Right" Rally (led by UVa alums Jason Kessler and Richard Spencer) puts it over the top compared to any other college. Another problem with UVa is that it's filled with "fake diversity" as labeled by my African American friends. From their perspective, the black kids they admit are more "Carltons from Woodberry Forest" than "Jamals from Highland Springs". To my friends, diversity should be more about culture and less about race. Just to be clear, this isn't my perspective as I'm not even close to comfortable making that comment. In addition, there's a severe lack of racial diversity within the greek system. That matters more to UVa vs. another college because of how big of a role the greek system plays within their social culture. If you had to, hypothetically, convince a basketball coach to turn down a better paying job in his home state to stay at Tech, how would you do that? I would tell him look at what you are building at VT. You can create d dominant program because nothing like that has been done at VT. Look at the legacy you can creates at VT. You creating something special very similar to what was started in 1993 at VT and that can be done with the basketball program. That kind of legacy and success would be eternal. Could you explain how Frank Beamer and his staff recruiter you? Compare that to kids you have been close to have been recruited these days. What is the biggest difference you see in how coaches act now compared to then? Also wanted to thank you for not only taking time to do this but your insight on Twitter, it's great to read the thoughts of someone with your experiences. Thank you! Beamer and his staff sold me and the other recruits coming out with me that we could take over the state. Beamer was just a cool yet passionate person. You could always tell he really cared about people - cooks, janitors, admins, other coaches and he respected families and was all about relationships. The kids now do value similar things that I did when I was being recruited but I think now there are more distractions and influences affecting their decisions. Curious as a recruiting insider to your opinion on how social media in particular has changed recruiting? How does the recruiting change now with social media presence being such a big part it seems to play these days versus how it was when VT recruited you in the pre cell phones and internet world? Overall would you say its had a positive impact or has it added more problems than its solved? I love social media and I think it is has been a great tool for recruiting but it has also been a problem at times for both coaches and recruits. I remember when Gaines got caught up and was Catfished by an individual who he thought was a coach from Florida. Unfortunately you also have some fans who get a little extra and forget that these are young men and cross the line when a kid doesn't pick your school. Or you have the trolling, which can be excessive. I think if I played now, I would like the interaction from fans and the followers but like anything it has to be managed appropriately. How would you suggest we get back the reputation of smash mouth football while also incorporating the spread and RPO tendencies in today's game? You've been pretty spot-on with your evals (Greg Dortch for example). Who do you think the top dogs in VA are for 2020, and who are some underrated ballers? I appreciate that! I love seeing these young guys coming up. To be honest check back in with me during August and September, that's when I typically start telling fans to check for some players. Well after your tenure at VT, the offensive line play seemed to suffer greatly. I've always placed blame on a particular individual, and subsequent individual (s) for the inadequacies that seemed to be present. Did you see the coaching quality slide? Or do you think it was a product of player talent/ability? Perhaps scheme was an issue. Do you think the OL is on the upswing? And is there anything you think could be improved? I think Offensive Line play has suffered in high school across the country. I think it definitely dropped off after my era. But I think it comes down to coaches in youth and high school football knowing how to coach offensive line play. I also believe with the growth of the spread offenses, you see coaches on all levels teaching position blocking instead of pushing players to be physical and drive their feet. I think they are talented players that are playing OL now in high school and college. But I do think some high school players just don't see the same benefit in playing on the line. During my era, you had the "Hogs" and other great offensive linemen in college and pro but I'm not sure it is celebrated the same way now. VT currently has good lineman right now and when it comes to OL play, don't sleep on cohesion and chemistry. Ugh, you were doing so well!!!! 2/2 on recent AMA's being team cake, I believe. Hey I do love me some pancakes!!! Standard question: your favorite moment on the field as a Hokie. Funniest team mates in college or pro experience? Favorite moment at VT?! There so many, winning the Sugar Bowl, the comeback at UVA, beating Miami the first time and my senior year at the Old Orange Bowl in OT. What advice would you give graduating VT players about what it takes to succeed in the NFL? What were the humps you had to get over? The NFL is such a business and you have approach it like that. Your work ethic has to been the best it has ever been. You have to also understand that even if you don't make it, it doesn't mean you weren't good, you just might been in the wrong system or they have too many players at your position. Looking back, I wish I put in even more work in college during the off season and keep in mind I was a very hard worker. College players really struggle to transition to the NFL because of the mental aspect. Essentially you are starting all over again. I remember when I was with the Ravens and we were in our meeting rooms going over film review, there was 29-33 different ways to run a draw play! What most excites you about the future of VT football? What things (whether they be internal/team related or external) give you the most cause for concern? I am excited to see if we can get over the hump and really make a run at a title. I am kind of over eventually and we are so close or 20___ is our year. Biggest concern is our inability to handle success. We continue to lose to programs that we should beat or teams that are inferior to VT. In order to become the program we need to become, we have to beat teams like ODU, GT, Wake Forrest, and Pitt. I've been beating this drum like crazy. We have to stop making excuses for losing to these lesser programs in this already relatively weak conference. We won't ever get back to where we believe VT should be as a program when we think it's okay to view GT, Wake Forest, Pitt, Duke as equals. We should be beating those programs every year, full stop. The occasional upset is fine, it happens to everyone (see Clemson in 16 and 17), but these should never be "toss up" games for us. Favorite place to eat in blacksburg? Our resident football expert French has expressed some concern over how our current offensive line coach, Vance Vice, teaches technique to our linemen. Do you see any concern with how our linemen play? The logo on your sweatshirt looks familiar. Did VT copy that for their academic logo? Are you to blame for that?!! Since you were on a Field & Track team, how far could you throw the discus and/or shot-put? I sucked at Discus throwing but my shot put was good. I wasn't committed though. I was good at shot put but I don't really remember my best throws. 1. What was the beef between Hampton Coach Mike Smith and the VT staff? 2. What is one concrete step VT could take to make former players feel welcome? Whats one thing (or more) in the way Coach Beamer went about his business that has stuck with you? "don't act special and people will treat you special". There are so many things he taught me - even now as I coach my son's football and basketball teams. Your favorite Bud Foster memory in a game and in practice or classroom? Too any funny stories for both! Lester was a savage and funny as hell! Lester would tell back up players why do you need socks? You know you're not playing anyway! LOL!! Lester is definitely savage about socks, but too many people abused the sock policy. What do you believe the ceiling for the football program is? And what makes you feel that way? I think right now it is an ACC Championship. I think VT needs to play with a sense of urgency. It is not just about getting talented players and highly ranked recruits but our attitude when we step on the field. Last season the only time I really saw VT play with a sense of urgency and VT pride was against FSU and UVA. There was a time when not matter the matchup VT played hard and even in loses, they left their mark on the game. Of course we have to get high-level talented players in the Burg but coaches have to challenge these players and hold them accountable. They have to earn everything and understand what and who they are playing for on Saturdays. Thank you for helping get Hokie Football to where it is today. How much of what you teach the young people in Vicktory Life was borrowed from your VT experiences? Who were the influences that provided those services to you (at VT or not) and how old were you? Do you know if VT currently has a coach or staff member that currently provides this type of life coaching to the players, or is it a team effort, or an area that might be able to be improved upon? A lot of what I learned at VT I utilize in my curriculum and teachings via Vicktory Life. the life lessons and life skills I learned at VT are so helpful and relative to what I teach middle and high school students today. Coach Stinespring, Coach Stinespring, a few professors including Nikki Giovanni, and my older teammates as well - Chris Malone - were all involved in my development as a man at VT. When I was at VT we had life skill staff members who were really helpful- Troy Peace and Doritta Ratcliffe are two that come to mind. I am sure they have personnel on staff that help with life skills - well at least I would hope so. I do believe a life skills staff member is essential in assisting so many student athletes transition from being a student athlete transition into Corporate America. So may players struggle with this, I even wrote a column about this once. This transition remains a very serious issue many players deal with on a regular basis. Thank you for taking the time to do this for us. These AMA's are great! 1) How much of the of defensive playbook do you remember from your time at VT? Did you have a "favorite" play call? 2) What's one thing people always misunderstood about you? 3) Who is your hero and why? 1 - Where do you see this program in 3 or 4 years? Better, worse, treading water? 2 - Are you for or against cheese? Mind you, we're talking about the dairy product. Who is the best follow on VT Twitter besides yourself and Joe. I think OX VT is hilarious. Thank you for doing this and great to hear what you've done after football. Great work! What do you think fans get wrong the most/misunderstand about student athletes and college football coaches? I think some fans don't realize how hard we work and many student athletes(football players) take pride in being good students too. Many of us are humble and not entitled. I think when we speak on issues like getting paid or wanting more from our scholarship, it is sometimes viewed as entitlement. Many college football players care about their players and are not only focused on winning games but the media typically focuses on solely winning games when many college coaches do so much more for their players and would do even more if somethings weren't considered against NCAA rules. Thank you again for doing this. Great insight in all your answers. When did you first know Mike had the potential to play quarterback at high level? The very first time I saw him play in high school. Literally, he was that good! Who was the most challenging Dline to lineup against? Any specific players who stand-out as a handful? All of these guys were handful in different ways. It is crazy to think but playing against my teammates especially the 95 and 99 d linemen prepared me for all the players I went against. What's your favorite Frank Beamer story? What most people don't realize is that Coach Beamer is a very funny guy. He is really funny. I remember when we beat WVU in 1998, one of our safeties from Western Branch, named Lorenzo Ferguson came up to hit the WVU running back but he got shook really bad! The running back was Amos Zereoue. We won the game but Coach Beamer in front of the team said what's going on here? What are you doing "fruit dog?! The entire team busted out laughing! I have never heard anyone called fruit dog before or since! Another funny story was when some of the football players got into with the wrestling team at a party and Coach Beamer found out and said next time you don't risk getting in trouble on campus or at frat party. You tell those guys to do it like when we played and meet somewhere off campus where no one cane see! LOL!! Thanks for coming on for this AMA Dwight! What does our recruiting profile look like in the DMV right now? What are some obstacles or perceptions that we need to overcome to have more success in that area. It seems we have had a tough time with Nova, DC, and Maryland kids recently. What kind of impact do you expect from Locksley at Maryland on the recruiting trail in regards to VT? The talent in NOVA and the DMV continues to be on the rise and over the last several years, Northern VA has produced players like Devyn Ford, Ricky Slade, DeShawn Hand, Tim Settle and Greg Stroman to name a few. VT is well respected up here but MD with Locksley will present a challenge but VT will still be able to get their players. MD just hasn't positioned themselves as they should be. VT hasn't had a tough time in NOVA due to effort, it is more about more schools taking notice and the DMV is more of a transient area where many families are living here from different parts of the country. I think you have hit the nail on the head with the comment on the transient nature of the families in the NOVA area. Turn over from political changes and military rotations keep a lot of folks on the move. To a lesser extent, the same maybe said of those living in the 757 area with the all of the military bases. I think keeping track of the talent in that environment would be more challenging. Baddest man you ever played with? Against? (1) If you were looking to build an O-line from scratch, for what characteristics (physical, mental, etc.) would you look that would fit in Fuentes offense? (I realize that there are not that many 6'10", 400 lbs Rhodes scholars who can run the 40 yard dash in under 3 seconds but try to be realistic - my attempt at humor). (2) Are there any kids out there that you would personally go after in recruitment that don't already "Alabama-esk" tattoos on their rear? I think you have already indicated that the Fall is a better time for you to address question 2, but do you have anything you would like to share from your perspective on 1 and 3? Dwight thank you for your time, and wonderful insight. Hope to see you around TKP.